She shook her head to rid it of the images and thoughts, and her companion noticed the gesture. "You okay?" There was concern laced in his voice, and she felt him lean closer to check her for injury. She nodded. "I'm fine. I just can't believe we only got a two-month break between the last war and the threat of this new one. 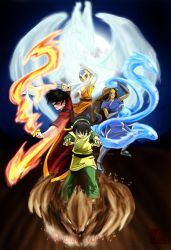 And, as if more battles aren't bad enough, this time we're fighting to keep Ozai alive." "It's messed up, isn't it?" He rubbed his pony-tailed hair and sighed. "But Aang's right: if Ozai is killed by these guys a proper war will start again, one that will involve the whole world."